The debate over whether ride-hailing services like Uber and Lyft are good for public transportation was heated in 2016. Some spoke out in favor of ride-hailing as a last-mile solution, while others argued passionately against it. In 2017, we’re predicting services like Uber and Lyft aren’t going to hurt transit. Instead, they’re going to encourage greater use of public transportation than ever before. Who knows, they may even inspire public agencies to develop their own ride-hailing services. When tech startups and transit agencies unite, sparks fly and magic happens. This year, we’re anticipating the largest increase in adoption of transit technology by transit agencies than ever before. Agencies’ embrace of emerging and existing technology isn’t just good news for the tech companies, it’s good news for riders and agencies, too. New apps and software can give riders a clearer picture of how well public transportation can fit into their lives. For agencies, new tech means greater insight into how their passengers are utilizing their services and how they can make those services even better. Over the past few decades, the percentage of Americans in their 20s, 30s, and 40s with driver’s licenses has dropped. For many, this decision to eschew car ownership is as much a lifestyle choice as it is a financial one. Owning and maintaining a vehicle can be expensive, especially if you live in an urban area replete with public transportation options. That’s why we’re forecasting an increase in the number of agencies using demand-response services to complement existing fixed routes. Demand-response services are flexible and allow agencies to respond to the evolving needs of their ridership community. Ford’s $65 million dollar acquisition of shuttle-van startup Chariot was just the beginning. Tremendous investment in the transportation industry has given rise to new companies and new expectations from existing ventures. There’s also a generous amount of duplication in the types of services provided by both new and existing enterprises. It’s this type of business climate that lends itself to new partnerships, mergers, and acquisitions—all of which we’re predicting in 2017. Uber is currently the most highly valued private company in the world. Yet, it’s appraisal notwithstanding, it isn’t a profitable one. As Hubert Horan writes, Uber’s strategy has been to drive out (pun unintended) incumbents in order to achieve a dominant market share. In 2015, Uber had a negative 143% profit margin while passengers paid only 41% of trip costs. Eventually, Uber’s investors are going to want to see positive profit margins. According to Fortune, Lyft’s not doing so well either, purportedly losing $50 million per month. As such, we’re anticipating some kind of shakedown to occur between or within these two ride-hailing giants. For years, transit agencies have viewed the number of passengers on their vehicles as a measure of success. In 2017, we’re predicting transit agencies will instead shift their focus to how their riders engage with them, approaching their understanding of ridership from a design thinking perspective. Our final prediction for 2017 is a big one: We will see the first driverless public transportation vehicle in service. Now bust out your tarot cards, scatter your runes, and consult your Magic 8 Balls. 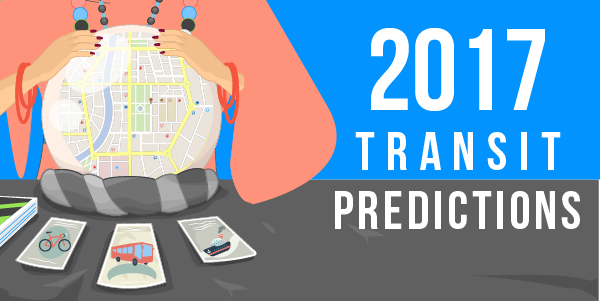 What do you predict 2017 has in store for public transportation?